In addition to these Google now offers ‘Automatic Matching’ as we’ve written about previously. The theory of these basic Match Type definitions are easily understandable – but in practice deciding the right Match Type isn’t always easy. The problem is that each Match Type is a filter of sorts, letting certain queries through and stopping (or reducing the probability of) your ad from showing for other queries. But these are rather coarse filters, and when considered against the massive diversity of search queries that users type when looking for something, plus the impact of other factors such as bids, quality score, and competitors, any Match Type choice becomes a pretty large compromise. A Brand New Example Let’s consider what might appear to be the simplest of all Match Type situations; your company name. Suppose that you’re running the paid search campaign for the well-known excess-capacity auctioneer Whaazooh.com. 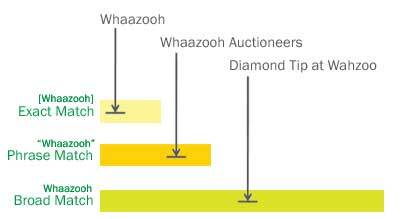 What Match Type should you place on the brand name keyword ‘Whaazooh’? Each step from Exact to Phrase to Broad opens you up to a larger quantity of (generally) less specific search queries. Some of these incremental queries are relevant and will prove profitable, but many will be irrelevant, or at least low converting. Buying ‘Whaazooh’ on Phrase match means you could easily pay for the click of someone who searched ‘Boycott Whaazooh’. And on Broad Match you almost certainly will pay for the clicks of people who searched for things which are 100% unrelated to your company, products, and industry. So deciding the right Match Type requires balancing the benefits of progressively more diverse query matches against the risks of progressively more diverse query matches. But for most keywords there is no perfect balance. 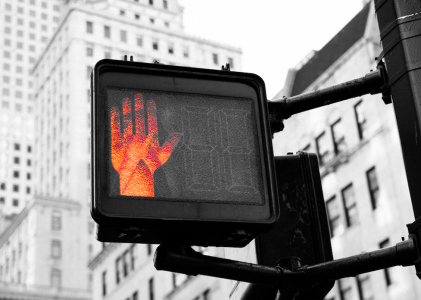 You’re left to try and find the most acceptable compromise between volume and profitability. Building Filters With Keywords and Match Types The problem is actually somewhat easier to solve if we think about it in terms of a group of keywords all working to attract a set of related queries. 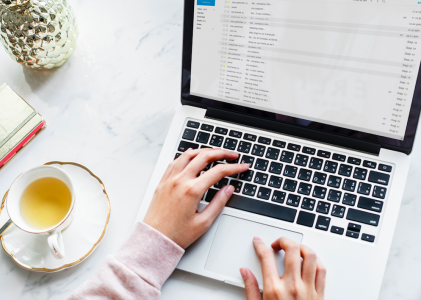 This is also more akin to your real world ad-groups, where there are many related words and phrases and each, depending on the Match Type could attract queries related to the same subject or using the same terms. Often even the same keyword will be purchased multiple times within one campaign, setting the Match Type differently in each instance. In this way you can build a layered keyword trap, using the Match Type option (along with our Bid and several other controls) to specifically capture certain queries at the Exact Match level, others at the Phrase Match Level, and still more at the Broad Match level. 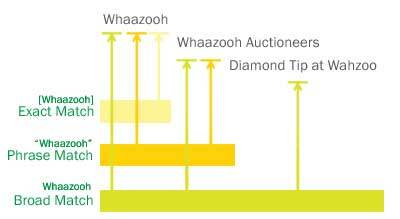 Considering the ‘whaazooh’ brand for example, we can buy the keyword and some related phrases separately at Exact, Phrase and Broad Match Types, and (assuming proper bidding and quality scores) we’ll catch specifically targeted queries at each layer while letting others fall through to be caught (or not) by the levels below. 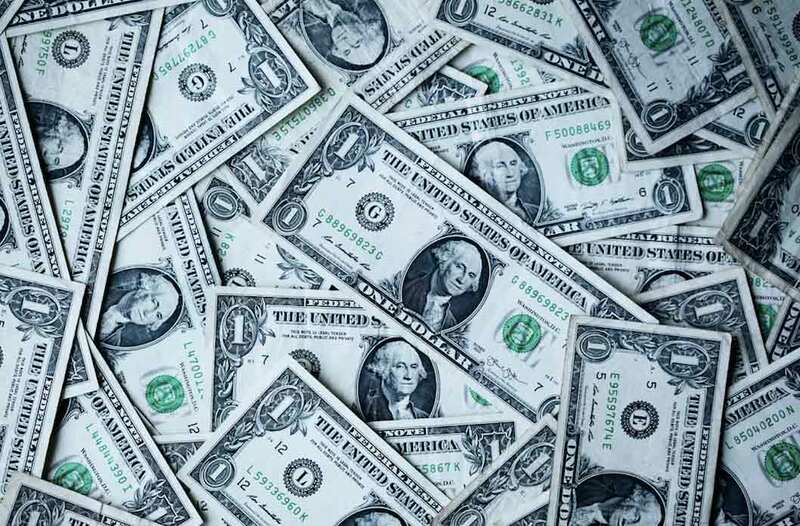 Over time, by watching the queries that each keyword attracts we can tune this system quite precisely, not only filtering unwanted queries with new negative keywords, but expanding our total volume through quality score and bidding improvements and tailoring the ROI of different query classes. In a later post we’ll take a detailed look at this tuning process. Taking Control The great benefit of this model is that it lets us take pretty significant control over the keyword to query matching process back from the search engines. Rather than just buying Broad Match keywords and letting the engine decide which queries are important, or buying just Phrase or Exact Match keywords and missing out on a lot of volume, we set the stage to have the best of all worlds. And with proper Ad-Group and Campaign configurations and good tracking software we’ll have amazing visibility into our progress, so we can understand things clearly and tune rapidly. To Be Continued This has been a long post, but covers only a fraction of the issues and side-bars and related topics and option settings necessary for really effect use of the Match Type options. In the next post we’ll look at this Match Type Filter Set more closely, and review the associated bidding strategy that makes it work and drive profitability. I’ll also discuss in more detail why this works due to a secret game of Rock Scissors Paper going on deep in the data centers of Google. Questions or Comments about Match Type? Please leave them in the comments!